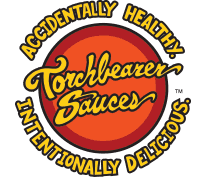 In a large sauce pot brown ground beef and ground pork with chili powder, salt and pepper, #4 Tingly or #7 Sultry Sauce™, Worcestershire sauce, onion and Torchbearer Sauce. Stir in the Black Bean Salsa and vegetable juice and simmer on low heat for 10 minutes. Mix flour and salt together in a mixing bowl. Cut in shortening. Sprinkle in water 1 tablespoon at a time, mixing until all of the flour is moistened. Gather into a ball and roll out large enough to cover your casserole dish.